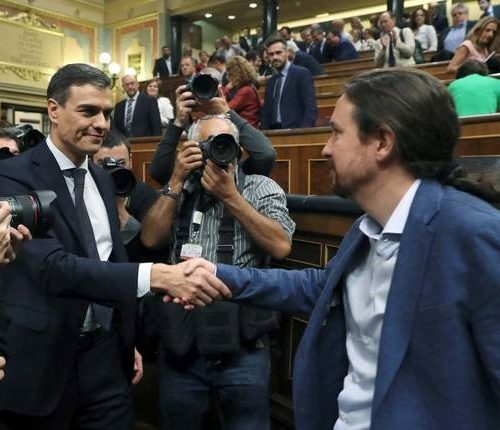 THE CHANGE OF GOVERNMENT IN SPAIN, THE CONSOLIDATION OF THE LEFT ACCORD AND THE INTERVENTION OF THE MASSES – The fall of the Rajoy government came from factors like the disaggregation of the Popular Party – its corruption evidencing its debility – and the crisis of the right wing. The most decisive element behind this change, however, is the constant and permanent intervention of the masses. 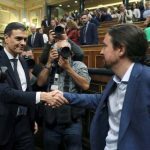 Pablo Iglesias welcomes the new Prime Minister Pedro Sanchez of the Socialist Party. The new Prime Minister Pedro Sanchez is the president of the Socialist Party (PSOE). A no-confidence vote brought Sanchez to government (6.1.18) along with the formation of a Front of left parties and nationalist sectors. This expressed the discontent and rebellion of people in large sections of society, and it precipitated the decomposition of the Popular Party (PP). Against Rajoy’s policies of austerity, the masses responded with huge mobilisations. The climate of rebellion in the country culminated with the Women’s Strike and the 8th of March mobilisations. The women demanded equal rights for men and women. They condemned patriarchy and opposed capitalism. This was a class strike on a world level, with huge demonstrations in the United States and Latin America. A situation of dual power is gripping society. As part of the functioning of the capitalist system, women are permanently faced with all forms of gender violence. This is encouraged by the political permissiveness of capitalism at all levels, from [the department of] justice to the repressive apparatus. Capitalist violence is crudest in its treatment of the most vulnerable – like the women, like the immigrants. They all want to be recognised as citizens, with full rights. The immigrants want to regularise their situations to gain access to work, welfare, housing, education. To defend those rights, they barricade themselves in certain buildings . Such actions have been going on for months, and in many towns. Supported by the Trade Unions and the social organisations, they create joint assemblies, rallies and other events. In Catalonia, their action was so effective that the president of the Generalitat (the Catalan government) and the woman Mayor of Barcelona turned up to visit them, listened to their demands and made promises where they thought they could help. There are many other struggles besides these social mobilisations. The Food Platform Workers has been on strikes and protests, as well as the workers of the meat industry where super-exploited immigrants are engaged. There have been actions at Amazon (large delivery company) and at H&M (multinational of the clothing industry). There were strikes at the steel plant of Cadiz, other strikes amongst the dockers  and the taxi drivers are rejecting the ‘uberisation’ of their sectors. Social confrontation has markedly increased in the country. If the movement has not reached the bigger companies, it is entirely due to the conciliatory policies of the main Trade Union leaderships. 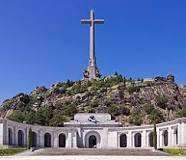 Monument that exalts the memory of Franco. The new government led by the Socialist Party is not strong. Because of its slight parliamentary weight, it may be forced to negotiate important measures with nationalist bourgeois allies. It has no plan to abolish the Labour Law , but it wants to change some of its aspects responsible for the present situation. The Sanchez government wants to restore the right to public health for everyone – undocumented persons included – which the PP had suppressed. 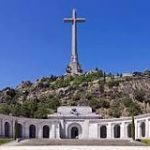 About the Law of Historical Memory  : it will have Franco’s remnants removed from ‘El Valle de los Caïdos’ where the monument, built by the labour of Republican prisoners, is used for the exaltation of Francoism. The Pedro Sanchez’ government has improved Spain’s immigration policy by allowing the Aquarius to dock, along with boats of immigrants turned away by the Italian government. There is a new government in Catalonia too. To normalise relations with it, Madrid has lifted Article 155 of the Constitution. As a result, Catalonia can now dispose of public funds. These changes are favourable to détente between the two governments, with the possibility of more accords to come. Now Pedro Sanchez announces his intention to transfer to Catalonia the Catalan prisoners presently in Spanish jails. This is another important element favourable to dialogue. Equal maternity and paternity leave. A State Pact to counter machismo violence. The State to recover all bailout monies from the banks. 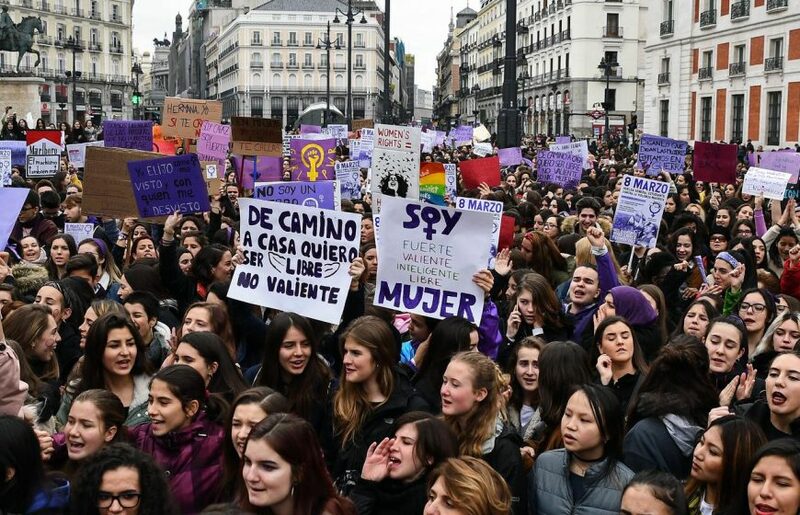 Derogation from the “Ley Mordaza” – a ‘gag law’ that suppresses certain types of public protests. Supposedly for ‘security’, it has led to the arrest of many Trade Unionists, artists, singers and others. A minimum inter-professional wage of 1,000 Euros pm. Close all the immigration detention centres. Another important proposal is to amend the parts of the Urban Renting Act (2015) that penalise the people with fewer means. Along with the crisis and the bursting of the ‘Real Estate’ bubble, this Act has meant more evictions and their grave social consequences. The Plataforma de los Afectados por la Hipoteca (the Platform of those affected by the Mortgage crisis) speaks out for tenants, the latter having now created their own social movement. The conditions exist for the people to go further. The unification Podemos-PSOE must give itself a programme of social transformation. 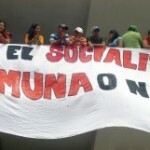 The Socialist Party must cast out the sectors of the Party’s apparatus promoted under Felipe Gonzales, because their economic conception is neo-liberal. Pedro Sanchez’ declarations admit to the importance of the accords being passed between PSOE and Podemos. This favours a process of change. The development of Left currents in the Socialists is already clashing with the old Party leaders. There is a change in the force relations. It is due to the struggle of the masses of Spain; but it is also due to the struggle in Latin America against imperialism’s plans, and to the great protest movements in the United States where large popular sectors condemn the policies of Trump. Note: The document from ‘thinkspain’ (note 2) is mentioned here for its factual report. 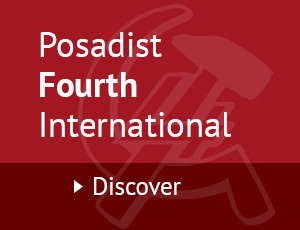 Posadiststoday.com do not necessarily endorse the positions of that organisation. A “marea” is a tide. There had been doubt as to the position of the EAJ-PNB, because ten days before the no-confidence vote, the MPs of that smaller organisation had ‘saved’ Rajoy by supporting his State budget. At the Southern port of Algeciras for instance. The Labour Market Reform Law was passed in 2012. More jobs were created but at lower wages. Companies not in difficulties can now impose group-dismissals on employees. Contract systems allow employers to get rid of workers rapidly and with no compensation. The Law of Historical Memory was passed in 2007. It recognised the victims of the Spanish Civil War. It gaves rights to victims of the Franco’s dictatorship, and their families. For the first time, a law condemned the Franco regime officially.